One of the tricky things about Neo4j is that we don’t enforce types. For any node (even those with the same label), your “phone number” property may be a 9 digit number, may be a string, may be an array of numbers, or strings, or may be something represented by an array of bytes. Neo4j doesn’t care, it’s schema optional, with heavy emphasis on the optional. To deal with this, we have the concept of a Fusion Index, that merges different indexes of different value types into one. In Neo4j 3.3 we introduced a Native Index for Numbers, in 3.4 we added a Native Index for Strings…and I think in version 3.5 we are planning on adding Native Indexes for all(most?) the types Neo4j supports. Neo4j 3.5 Alphas are already out in the Pre-Release section of the download center and you can expect 3.5 GA to drop before the end of the year (probably a couple of weeks after Halloween). Ok so why am I telling you all this. Well… In the schema indexes of 3.3 and earlier that used the “die hard” Lucene indexes reads were pretty fast for both STARTS WITH and CONTAINS type of queries. However it was terrible at write speeds. The new Native Indexes are very fast for writes and STARTS WITH, but not so much for CONTAINS. Also neither schema index supports Full Text and Case Insensitive type of searches. So our Auto Complete feature has to take that into account. We have options, we could use the “Explicit Indexes” which map directly to Lucene Indexes and deal with that. We could modify the “dbms.index.default_schema_provider” parameter to use “lucene-1.0” and get fast CONTAINS, or we can just go with the default for 3.4+ and use the new Native Indexes. 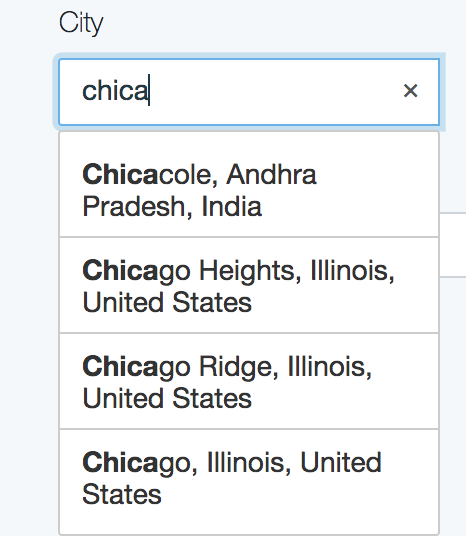 In our current use case I want to Auto Complete on “Attribute”, “City”, “Tag” and “Thing” nodes so I will stick with the default native indexes of Neo4j 3.4. 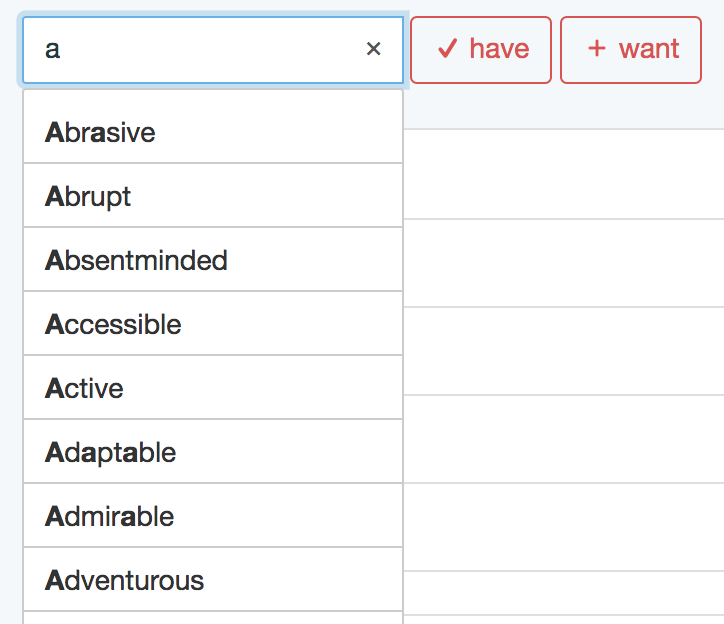 If we were adding full text search features to the dating site, we would probably make a different choice. Then we use “StringSearchMode.PREFIX” to indicate we want a “STARTS WITH” type query. Why did we call it that? I don’t know and it doesn’t matter… which reminds me, those are the names that Helene gave her pet turtles back in college. So when people would ask her, what are your turtle’s names, she would sincerely answer “I don’t know” and “It doesn’t matter”. Yes, she is a genius. Alright, for each node in our iterator we pop the id and a display property. We can now use this auto complete in our registration. Flipping to the front end, we can add this to our API. We could have gone with a general auto complete path, but I want to specify city here to make sure I only use the lowercase_full_name property. We can use the same ideas for the Attributes and Things. That’s it for autocomplete for our site. Stay tuned for the next part.